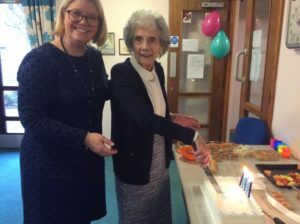 Hanover’s West Park Court sheltered development in Elgin held a party to celebrate a major anniversary in the history of the site. 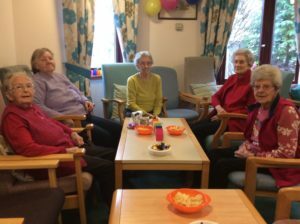 Tenants and staff at the development got together to enjoy a special buffet lunch to mark 25 years since it opened. They were joined for the occasion by newly appointed Hanover (Scotland) Board member Jo Roger. The development’s anniversary coincides with another important anniversary for Hanover (Scotland), which is celebrating its 40th anniversary during 2019. Over the last 40 years, Hanover (Scotland) has been at the forefront of providing innovative care and housing to meet varying needs and supporting residents to experience full and active lives. We will continue to lead the way, utilising new technology and innovate methods of housing design and care delivery to adapt to a changing world, further improving the lives of residents whilst creating and supporting vibrant local communities. The honours of cutting the anniversary cake at the party, which took place at West Park Court were given to Mrs Grace Gates who was the first person to move in when the development opened a quarter of a century ago. Susie Cheeseman, sheltered housing manager at West Park Court, said: “It was lovely that everyone came together to celebrate 25 years since West Park Court opened its doors and it is especially nice that the anniversary coincides with Hanover (Scotland) Housing Association’s 40th anniversary. It was the perfect excuse for a party and we all had a brilliant time.